The Santa Fe University of Art and Design announced on Aug. 13 that 2014 Wood River High School graduate Caleb Garvin has been awarded a prestigious Robert Redford/Milagro Initiative Scholarship to study contemporary music at the university. Garvin is only one of 16 students nationwide to be selected for an Emerging Artist Scholarship through the Redford/Milagro scholarship program. The university reported in a news release that the scholarship will cover between $7,000 and $15,000 per year depending on the program of study. In addition to contemporary music, other scholarship winners will study creative writing, film, studio art, theatre and digital arts. Garvin also was awarded local scholarships earlier this year from the Sun Valley Center for the Arts and the Leon Friedman Memorial. 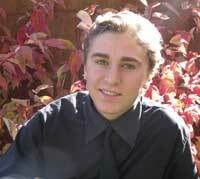 He was named one of Wood River High School’s “outstanding seniors of performing arts” for the 2013-2014 school year. Garvin is also an artist and in 2012 participated in an art project to raise money for Camp Rainbow Gold, an American Cancer Society program. For the fundraiser, students produced and sold original prints mounted on matbord.